16mm Ultra Wide F2.0 Lens. Maximum Aperture: F2.0. Focal Length: 16mm. Rokinon 16mm T2.2 High Speed Wide Angle Cine Lens for Sony - NEW open Box! NICE! This is a Rokinon 16mm T2.2 High Speed Wide Angle Cine Lens for Sony. It is a floor model (new in open box). 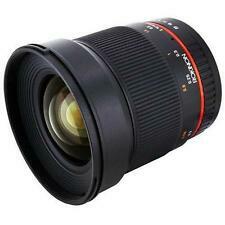 Rokinon 16mm T2.2 Ultra Wide Angle Cine Lens for Sony E-Mount VDSLR - New Lens! Its build and construction are superb! The lens also features a removable hood and takes a 77mm filter. The lens is available for the following mounts: Canon EOS, Nikon, Sony Alpha and NEX, and Micro Four-Thirds. Aperture Maximum: T2.2 Minimum: T22. Bayonet Mount Lens Hood. Mount Type Sony E. Standard Gearing for Focus and Iris. Multi-Layer Coating to Reduce Flare. International Policy. UMC Lens Coating. Sony E (NEX) Mount Lens. Autofocus No. Front Lens Cap. Rear Lens Cap. Prices do change frequently. Weight 1.35 lb (613 g). It provides a 79.5° angle of view which translates into a 35mm format equivalency of 25.6mm. A fast maximum aperture of f/2.0 is effective in low light shooting and provides shallow depth of field. UMC lens coating facilitates even light transmission and reduces ghosting and flare. The Rokinon 16mm T2.2 Cine Lens is a wide-angle lens optimized for digital cinematography. The focus and aperture rings feature industry-standard 0.8 pitch gearing for attaching a follow focus unit. 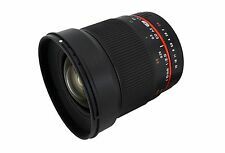 Samyang 16mm F2.0 ED AS UMC CS Ultra Wide Angle Lens for. The new Samyang 16mm F2.0 accepts 77mm filters and can use ND, polarisers or any filter with a 77mm filter thread The Samyang 16mm features a wide, ribbed manual focus ring which is smooth and well-damped and provides a positive manual focus. �E Body size: 43 �~ 2.3 (H �~ W: cm). �E Target age: 15 years old and above. Important . The Rokinon Cine DS 16mm T2.2 is a Rokinon CINE DS lens. As such, its gears will be unified with any other Rokinon Cine DS lenses and the gears will line up with one another. There will be no need to re-adjust your follow focus. Rokinon 16mm f/2.0 ED AS UMC CS Lens for Sony E Mount Combo DealLens Specs Vari-Angle Prism Image Stabilization. Doublet Field-Flattener Lenses. Rokinon 16mm f/2.0 ED AS UMC CS Lens for Canon EF-S Mount Combo DealLens Specs Vari-Angle Prism Image Stabilization. Aperture Maximum: T2.2 Minimum: T22. The ultra-soft microfiber cloth is both gentle and highly absorbent! Lens Pen Cleaner. Lens Cap Keeper. Lens Pen Cleaner SKLP2. Lens Cap Keeper CAPK. This is Lens Cap Keeper Rope! 1- Rokinon 16mm T2.2 Cine Lens for Sony E. TheRokinon 16mm T2.2 Cine Lens for Sony E is a wide-angle lens optimized for digital cinematography. The focus and aperture rings feature industry-standard 0.8 pitch gearing for attaching a follow focus unit. Brightness: F2.0. Focal length: 16mm. Minimum focusing distance: 0.2m. for SONY E. Corresponding mount: Sony aE mount. Minimum focus is just 0.2m, and aperture setting is fully manual via a traditional ring on the barrel. Lense Converters. Front Lens Cap, Rear Lens Cap. We are willing to solve any problems. We make it more long-lasting. Its build and construction are superb! The lens also features a removable hood and takes a 77mm filter. Ultra wide angle 16mm lens. Lens not Zoomable. We stand behind our products.